"Tomato figs" are one of those odd mash-ups that makes you wonder if there's some sort of typo or missing grammatical modifier. But when I saw this phrase in a book on preserving, I was lucky enough to have a explanatory recipe to go with the name. A more accurate name would be "tomatoes boiled in sugar and preserved like dried figs." But just saying "tomato figs" does have the added bonus of perking up your curiosity. This recipe is meant to work with meaty Roma tomatoes, which do look a bit like mission figs. In a nutshell, you blanch and peel your tomatoes, then put 8 lbs of tomatoes into a pot with 3 pounds of brown sugar. The tomato juice will run, creating a concentrated sugar syrup that permeates and preserves the tomatoes. 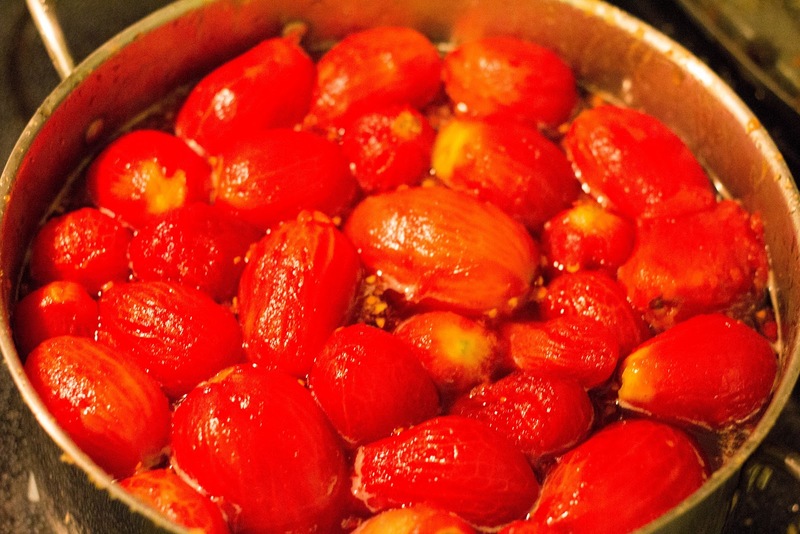 The tomatoes gently infuse and simmer for about 2 hours, just to concentrate the sugar and run off excess moisture. Afterwards, you dry the tomatoes in a food dehydrator (or over several days in the sun, if you're a traditionalist or just some Luddite) until they have a firm, dense texture, but not to the point of being leathery. Finally, the tomatoes are dusted in confectioner's sugar and stored in a cool larder, where they should keep for a year or so. Everything in this recipe made send, but I kept thinking, "God, please don't let me be spending two days ruining 8 lbs of tomatoes." Then, curiously, the tomatoes started to disappear. I wasn't sure of the cause, until I caught Carla with her hand in the dehydrator, sneaking tomatoes. "These are so gooood!" she exclaimed. They really are good, although I still find them odd. 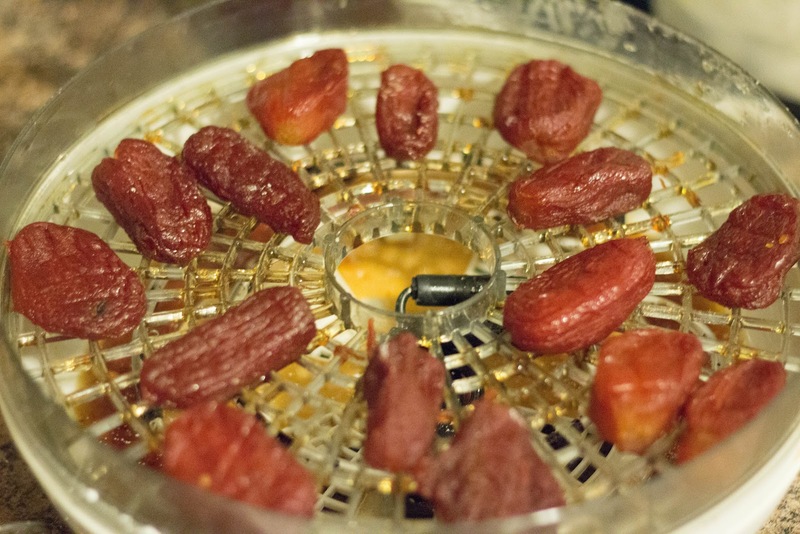 They're sweet and chewy and have a deep, fruity flavor, like a dried fig or date. Classified as a "sweet meat," it's recommended that you serve them as a dessert, or use them in stuffing and baked goods as you would traditional dried fruit. Carla was a little taken aback at the 3 pounds of sugar used, but I reassured her that a lot of that sugar stays behind in the syrupy solution the tomatoes leave behind in the simmering pot. So now I've got about a liter of this syrup, which the recipe just says "save for other uses." Perhaps the colonial housewife would know what to do with this tomato-tasting sugar syrup, but I really don't see it as a sweetener for coffee or a topping for waffles. It might be a little involved, but I'm going to make it into a tomato vinegar, which I think I might actually use more than a tomato syrup. So I'm fermenting it into alcohol now, then when that process is done, I'll introduce a vinegar "mother" into the 'tomato wine' to convert the ethanol into acetic acid. So look for an update on that in about 3 months or so! These really were delicious! I was amazed. 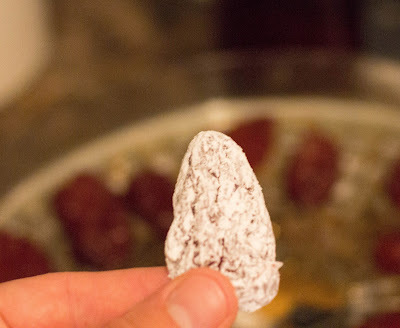 I used small pear-shaped tomatoes so when dehydrated they turned into bite-sized nibbles. thanks for the suggestion. Thanks so much! I'll be honest, of all my recipes I've posted, this has been one of the quirkiest and one I thought would be the least likely for someone to try. But I'm thrilled you liked them! I was so surprised how good they were.